Commenter A:"In my opinion, anyone who is unarmed that willingly fights somebody who has a weapon is a moron." Commenter B: "Bruce Lee fought many people with weapons unarmed. 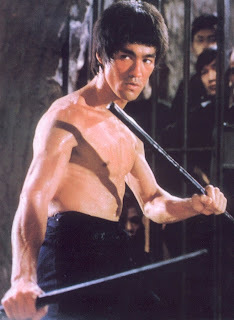 And he is the greatest martial artist ever, and not a moron." One of these commenters made a truthful statement. The other just engaged in mindless hero worship. What do I mean by mindless hero worship? Consider the line about Bruce Lee, “And he is the greatest martial artist ever...” For one, Lee is dead, so saying he “is” something is not really accurate. But even if you switch out the offending “is” for “was,” the “greatest martial artist ever” bit is silly and hyperbolic. Martial arts have been around for thousands of years. Bruce Lee was around for 32 years. There have been countless martial artists both before and after Lee. To say he was the “greatest ever” is to make some pretty major assumptions. This is not to diminish Lee's awesome accomplishments. Bruce Lee is undoubtedly the most influential martial artist in memory. His reputation is secure, and there is no need for needless exaggeration. 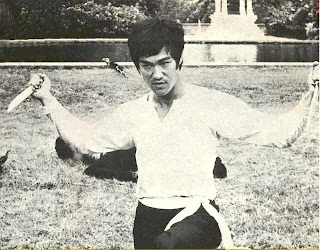 And speaking of exaggeration... “Bruce Lee fought many people with weapons unarmed.” Really? I am not aware of any examples of Bruce Lee fighting “many people with weapons unarmed.” Sorry, but movie fight scenes don't count. (Here's a secret: Movie fights are not real fights.) I don't even know how often—if at all—Lee sparred empty handed versus an armed opponent. Even if he did, here's another secret: Sparring isn't real fighting either. As for Commenter A and the observation that “anyone who is unarmed that willingly fights somebody who has a weapon is a moron..." Yep, I can get behind that. It's important to train in empty hand combat against an armed opponent because those sorts of situations do occur and sometimes you have no choice. But to willingly get into that sort of fight? Kind of moronic indeed.